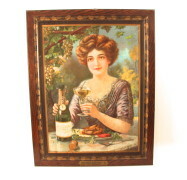 Featured is a beautiful lithographic print from the Diamond Wine Company in Sandusky, Ohio circa 1900. 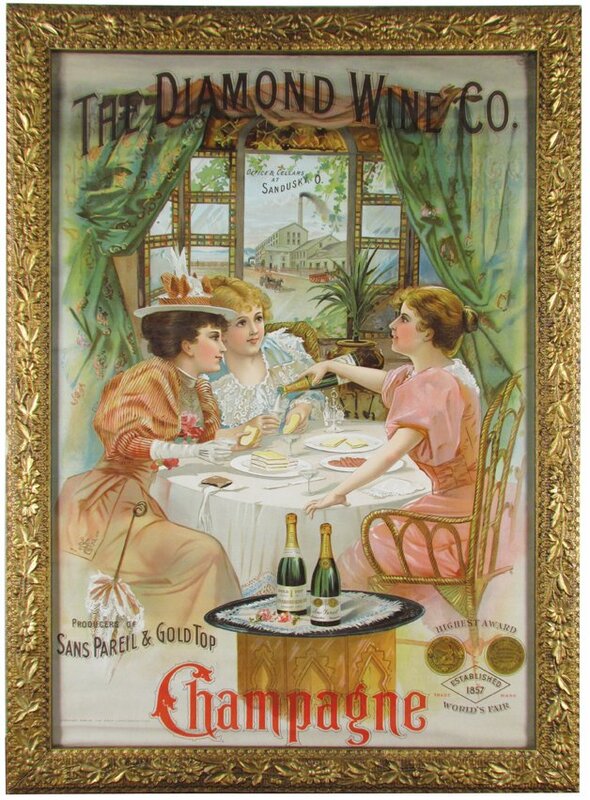 This print advertises their Sans Pareil and Gold Top Champagne brands and features three Victorian era woman drinking the product with a view of the factory outside their window. 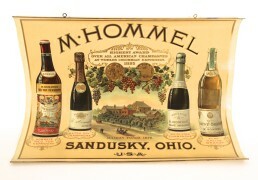 Around 1900 Sandusky was well known for their wine production and other companies with a large presence were The H. Hommell Wine Company, The Duroy & Haines Winery, and The Sweet Valley Wine Company. This is a beautiful lithographic print from the Albert Hertz whom was based in Gloversville, New York, Circa 1905. Mr. Hertz was a dealer in both wines and whiskies before prohibition. 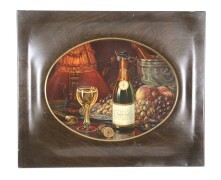 A beautiful metal advertising sign with embossed bottles and grapes from the ToKalon Winery in Oakville, CA. This is now part of the Robert Mondavi Winery in Napa Valley. 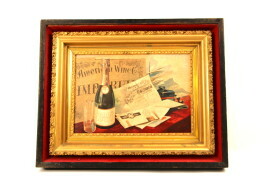 The one bottle is dated 1884 reflecting an award the brand won that year. Pictured is a metal charger sign from the Stone Hill Winery Co. in Hermann, Missouri. Circa 1900. This metal charger has two small holes on the rim area designed to allow it to hang on the walls of a local establishment which was selling their product. 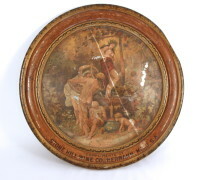 This is a serving tray from the Cooks Imperial Brands of Wine and Champagne, manufactured by the American Wine Company in St. Louis, MO, 1902. 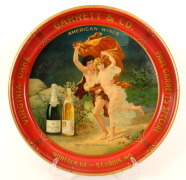 This is a Virginia Dare Wine serving tray from the Garrett Company based in Saint Louis, MO and Norfolk, Virginia, 1925. 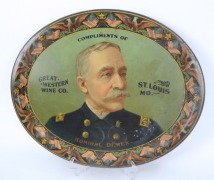 This is a rare serving tray from The Great Western Wine Company based in St. Louis, MO, 1898 featuring Admiral George Dewey. 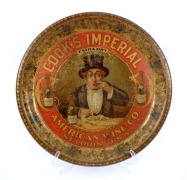 Circa 1900 Self Framed Tin Metal Sign from the American Wine Company in Saint Louis featuring a beautiful lady and the Cook's Imperial Brand of Champagne which was their flagship brand at the time. This is a super rare sign, and the only one I have ever seen. A great example of a self-framed sign. American Wine Company Wooden Self-Framed Box Sign. This is a very rare sign, and was probably displayed in the office of the American Wine Company. This was too expensive to be placed just anywhere. Saint Louis, MO based company with a large regional distribution at that time. Ca 1905. 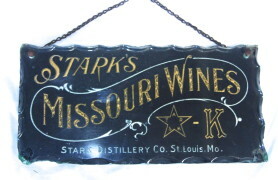 This is a Pre-Prohibition Reverse-on-Glass (ROG) Sign manufactured by the Stark Missouri Wines Company in St. Louis, MO, circa 1910. 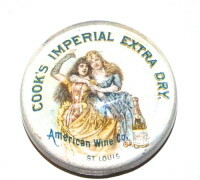 Cooks Wine and Imperial Champagne Co Glass Advertising Paperweight, St. Louis Missouri Company. The American Wine Company was one of the nations largest wine producers and they sold their wine far and wide. Ca. 1910.